Congratulations on the upcoming arrival of your little one! We are so excited to help you document their life through portraiture. Whether you choose to take part in the First Year Program, or select only a single session, we are here to celebrate your child. Our photographer Amy Garro is a licensed and insured photographer, trained in infant safety, and fully updated on all vaccinations to keep your little one safe and comfortable. She creates timeless images, focusing on connection, love, and your child’s beautiful tiny traits. For the minimalist family, this session takes place within the first few weeks of life. Choose between an in-studio session or an in-home lifestyle session, depending on your family’s style. We offer minimalistic studio sessions (classically beautiful, with white, gray, and black backdrops) and in-home lifestyle sessions. Scroll down to see examples and additional details. Babies change so quickly in the first year of life! Those tiny eyelashes, tight fists, and fierce yawns quickly turn into first words and steps. By scheduling multiple sessions, we’ll be sure to capture all of those sweet milestones! You can completely customize the First Year Program to fit your needs and photography preferences. Choose the number of sessions you’d like, and any combination of studio and in-home settings you would prefer. Not sure? We can chat about that to help you decide! Our portrait experience always begins with an in-person consultation at the studio. This allows you to discuss with Amy how you’d like to be photographed, as well as tell her about your family’s personality, and go over pricing in detail. Click the button below to schedule your consultation, or keep scrolling for examples and some basic pricing information! Classic, timeless newborn portraits with a minimalist approach. We focus on the beauty of your child, with simple styling and baby-led posing. These sessions take place at the studio, preferably within the first 7 - 14 days of life. Parents and siblings are included. These images will look amazing hanging in your child’s nursery! Tender, heartfelt, story-filled images with your home as the backdrop. We focus on documenting those sweet - yet normal! - moments of caring for a newborn. These sessions take place in your home, anytime during the first 4 weeks of life. Parents and siblings are included. These images are perfect for an album! From sweetly sitting to cake smashes, and everything in between, studio milestone sessions document your child’s changing personality. These classic images, with simple backdrops and few to no props, beautifully complement studio newborn sessions. Grandma and Grandpa will adore these! We suggest 3 month, 6 month, 9 month, and 12 month milestone sessions. 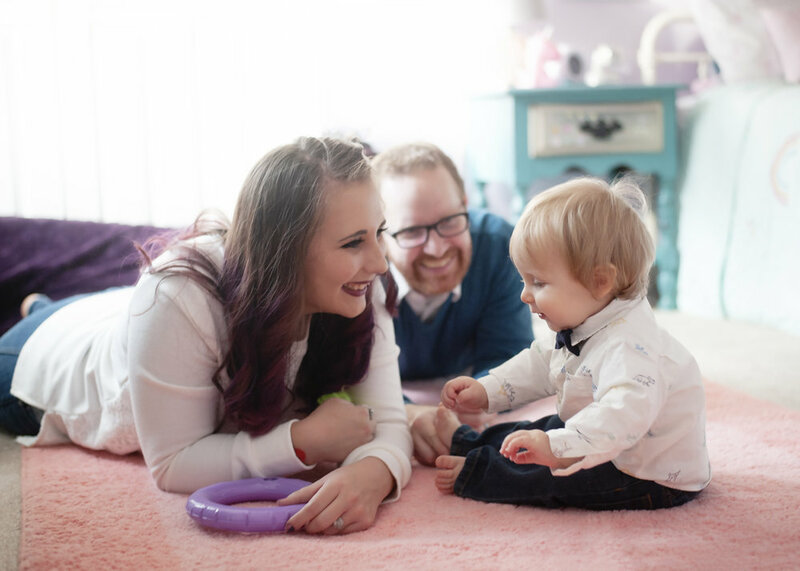 There are just so many precious things about your child’s first year - let’s make sure we capture those home moments, too! Nursery details, bath time, learning to eat with a spoon, playing with the family, nursing and snuggling in the rocking chair: these are the memories your children will love to look back at. We suggest 3 month, 6 month, 9 month, and 12 month milestone sessions. Session fees include the time and talent of the photographer. Two to three weeks after your session, you’ll return to the studio to select your favorite images and purchase only what you love. We offer digitals, keepsake prints, and heirloom albums that last for generations. Every physical product comes with its matching digital image. Select 10 or more images to receive your choice of matching album or framed memory box with your images. Order small prints (starting at $4) through our online ordering system, or through your preferred print lab.